Want a natural way to reduce the effects of aging on your skin? A downward dog pose, that is. Let’s start with the obvious: yoga reduces stress, and that can benefit your skin. We have a number of studies showing that yoga helps you relax. In 2012, for example, researchers at UCLA found that chanting a yogic meditation for just 12 minutes daily for eight weeks helped participants reduce the body’s inflammation response. Inflammation is a normal response to stress, and besides the sun, is one of the worst things that can happen to skin. It’s linked to acne, redness, rashes, fine lines and wrinkles, allergic reactions, sensitivity, and more. An earlier 2008 study found that yoga practitioners were better able to regulate their bodies’ stress responses, which could translate into reduced heart rate, lowered blood pressure, and easier respiration—all signs of greater relaxation. And in a 2005 study, women who took two 90-minute yoga classes a week for three months significantly improved their stress, depression, anxiety, and fatigue. 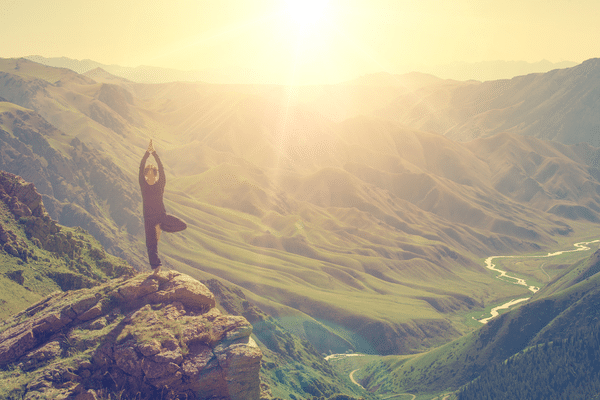 A 2014 study found that yoga could even help reduce inflammation in cancer patients. After three months of yoga, all three markers for inflammation were reduced by 10 to 15 percent. Reducing inflammation and stress allows the skin to perform its regular functions without interruption. That means faster skin healing, a more intact outer barrier, and healthy moisture levels, which all translate to younger-looking skin. All those poses and deep breathing helps get your blood moving—and that’s good for your skin. Why? Let’s look at the opposite situation: poor blood circulation. When you don’t get enough blood to the skin, your face may look pale, pasty, or dull. A lack of nutrients can slow healing, making blemishes last longer. It can also slow down collagen production—which is key for firm, taut skin—and rob the skin of the nutrients it needs to hold onto moisture, resulting in dryness and the appearance of fine lines and wrinkles. Good circulation, on the other hand, gets oxygen and nutrients to the skin cells, and also helps to flush cellular debris away so it can’t sit around and cause problems. Poor circulation, for example, can lead to puffiness around the eyes, caused by fluid retention. Getting that circulation moving on a regular basis can help prevent that. Yoga has shown in a number of studies to help stimulate healthy circulation. Research has found that it increases blood flow and levels of hemoglobin and red blood cells, which allows for more oxygen to reach body cells, enhancing their function. Want to get a little flush to your face? Try an inverted pose and voila! If you’re someone who suffers from acne, you may want to check into a yoga class. That’s because we have evidence that improved digestion can help keep skin clear and healthy. Several studies have shown that yoga can help alleviate minor digestive problems and encourage normal, healthy digestion. For one thing, it reduces stress, which can ease digestive woes. Excess stress has been linked to constipation and diarrhea. But certain poses are also known to help stimulate digestion. The common cat/cow pose (in which you get on your hands and knees and alternately arch your back, then round your back), is also good for stimulating the digestive system. A 2013 study found that yoga showed promise in helping to ease the symptoms of gastroesophageal reflux disease (GERD), and some people have found it effective in easing irritable bowel syndrome (IBS). That there is a connection between the skin and the gut has long been suspected, and recent studies have supported the idea. Scientists have found that when digestion slows, it changes the balance of good-to-bad bacteria in the gut. That can lead to inflammation that shows up on the skin. In a 2014 study, for instance, researchers found that probiotics taken internally, which support healthy digestion, helped improve skin. Keeping your digestive tract healthy through yoga may give you the added benefit of clear, calm skin. Though studies are still inconclusive about facial yoga, a lot of people who have tried it swear by the results. A series of exercises designed specifically for the face, it helps strengthen the muscles in the face—which is a powerful benefit on its own. Proponents say that facial yoga can help you look younger — relaxing tension-filled expressions, smoothing the appearance of skin, and even creating the effect of a natural face-lift. The jury is still out on these benefits, but our friend Fumiko has had a lot of success with it. She got in a car crash years back that injured her and affected her face. She used facial yoga to recouperate from this, and was blown away at how it made her skin look. She now teaches face yoga and has online videos that you can follow along to! If you’d like to try it, we have a few of her videos on this site that can get you started. (The Mini Facelift, and The Double Chin Lift.) Performing the exercises for 10-20 minutes a few times a week may help you reduce wrinkles, increase skin tautness, and give your skin an overall more youthful look. If you regularly practice yoga, what benefits do you notice in your skin? Please share your observations with our readers. International Journal of Yoga – Can Yoga Be Used to Treat Gastroesophageal Reflux Disease?